The left seemed to have been infected by the mad-dog rhetoric of Beppe Grillo of the Five Star Movement. 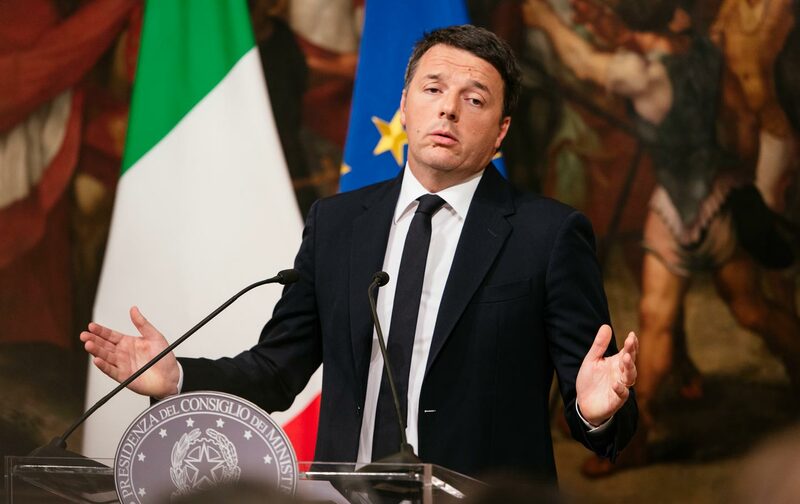 Rome—On Sunday, Italian Prime Minister Matteo Renzi was overwhelmingly defeated in a referendum to reform the constitution. (On Monday he handed in his resignation, which goes into effect once the budget has been passed.) The referendum, to reduce the size of the Senate and limit its powers, lost by a huge margin of 40.1 percent to 59.8, and a surprisingly robust 64 percent of those eligible went out to vote. Pre-election scare scenarios about a No result—that it would force Italy to leave the euro, as Wolfgang Münchau argued in the Financial Times; that it would severely damage Italian banks deep in bad debts, as The Wall Street Journal warned—seem to have been somewhat inflated. The day after, all was more or less well on the financial front. But the vote, which many interpreted as a “How am I doing?” plebiscite on the prime minister himself, certainly did reveal that Italians are very unhappy with the status quo. The victory of the No is unmistakable, but what does it mean? International commentators were quick to liken the Italian vote to the “populist” tides that powered Brexit and Donald Trump. And certainly, parties like the Five Star Movement (M5S) and the rank xenophobes of the Northern League (LN) feel they are the victors. For as Saviano notes, one of the great paradoxes of the No is that it also encompasses a part of the left—a left that in this critical moment is recklessly and foolishly divided. Much of the blame for that disunity lies with Renzi, a cocksure, scrappy 41-year-old whose personal style grates on seasoned progressives, and whose lackluster policies were shaped by European austerity rules (however much he tried to change them) as well as the need to compromise with the right because he lacked a clear majority in parliament. Even the late endorsement of the respected former prime minister and EU Commission president Romano Prodi didn’t save him. But some blame must also be assigned to the minority of dissidents within his own Partito Democratico and those in the left movement Sinistra Italiana (SI) who joined the 60 percent voting No on the referendum. Just How Left-Wing Is Italy’s New Prime Minister? In many ways this is the language of the old left, with its revolutionary origins, and the stance of what Italians call un partito di lotta, e non di governo, “a party of struggle, not a party of government.” The two, idealism and pragmatism, rarely seem to coexist in the same persons. And with a few exceptions, the Italian left has long been more a party of struggle than a party of government. The rhetoric of struggle comes naturally; the compromises of government are painful. But another SEL colleague who has held government office didn’t agree. Nichi Vendola, who this year became a father with his longtime partner Ed Testa, maintains a blog now that he is no longer governor of Puglia. Before the referendum, he wrote: “Buried beneath the political chatter lies a burning social problem, the combination of a middle class growing poorer and the precarious nature of the younger generation’s lives (not to mention their jobs).” It is a threat to Italian democracy that is not being addressed by the government, he said. Not incidentally, Vendola reflects a southern perspective. Another southerner, the mayor of Naples Luigi De Magistris, an independent, writing on Facebook after the vote, went straight for the jugular. The referendum result was “a great democratic victory,” he said, calling Renzi “an authoritarian stalker who has been repelled.” His extremism was a sample of the bile expressed on social media in the weeks before the vote, particularly against the prime minister. The rhetoric on the web was explosive, as if the deepest social strife lay between the center-left and the further left. As prime minister in 1998-2000, D’Alema was the first former Communist ever to lead an Italian government. In 1997, as an MP and chairman of a bicameral committee on constitutional reform—tasked with examining a legislative process that some felt hampered governance because the constitution so scrupulously limited executive power—D’Alema had devoted more than 12 months of his time to forging a broad agreement on reforms. He was then dramatically out-maneuvered by Silvio Berlusconi, who switched position overnight, upturning the negotiation tables and ending any further real attempt at such reform before Renzi came on the scene. In a party dominated by elders like D’Alema, Renzi has been one of the few younger politicians to challenge the old Communist Party elite and the only one to grab the leadership. He did so by attacking the old guard in no uncertain terms. It was time to “send them to the junkyard,” he said. His iconoclastic approach and brash language, reminiscent in some ways of Berlusconi’s offhand and unceremonious style, evoked visceral dislike among party regulars but appealed to the young. Even among those who don’t like him, some on the left have come to appreciate that his strident style has been shaped by the unnatural (someone called it “feudal”) grip on power of D’Alema and his peers. In a mess, Beppe Grillo and his M5S, along with the equally demagogic but even more reactionary Matteo Salvini of the Lega Nord, are crowing and calling for immediate elections. Renzi, too, wants to go to the polls soon, emboldened by his 40 percent polling. But before that can happen, Parliament must approve a new electoral law. The one passed this year in the Chamber of Deputies, which awards a majority premium to the winning party, might go to reward the M5S, should Grillo edge out the PD. The much smaller Lega Nord would have to form a coalition with other right-wing forces to govern. Both parties are hostile to the European Union. Gone, with Matteo Renzi, is the European leader who has arguably done the most to try to push the EU away from austerity. “To me, it looks (as in post-Brexit Britain) that nobody wants to govern Italy. It’s too much of a hot potato. The post-referendum path is not as smooth as it appears to some,” said the young Somali-Italian writer and activist Igiaba Scego. It was an observation at least as pertinent as that of any of the professional political analysts. Beyond Italy’s political squabbling lies a continent in deep economic trouble, suffering the longest recession of modern times, stymied by an implacable ideology of austerity, confronting a wave of angry, proto-fascist, anti-establishment sentiment. A situation that only the broadest left can hope to counter.